After the rabbi spoke, the seminarians of Redemptoris Mater sang “Shema Israel,” a song based on one of the most important [rabbinic] prayers [which in rabbinic Judaism denotes rejection of Christianity in general and the doctrines of the Trinity and Divinity of Christ in particular]. 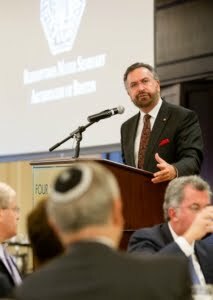 NORWOOD — The work of bringing Catholics and Jews together remains incomplete but is progressing, according to Rabbi David Rosen, guest of honor at the Third Annual Gala Dinner supporting the Redemptoris Mater Archdiocesan Missionary Seminary of Boston on June 24. Rabbi Rosen is the International Director of Interreligious Affairs of the American Jewish Committee and Director of its Heilbrunn Institute for International Interreligious Understanding. He is also the former Chief Rabbi of Ireland [and former leader of the Orthodox Judaic community of apartheid South Africa]. In November 2005 he was made a papal Knight Commander of the Order of St Gregory the Great for his contribution to promoting Catholic-Jewish reconciliation. But he said the traditions must be continued for younger generations. “It is here that the role of educational and formation structures is so important, and where the work of the movements — in particular the Neocatechumenal Way — has become so critical,” he said. The rabbi stressed the importance of the work of the movements and people that embraced “Nostra Aetate” beyond the importance of the declaration itself. “As one of the most powerful of these Catholic movements, especially in the Spanish-speaking world, but indeed across the globe, the profound commitment of the Neocatechumenal Way to ensuring that the pathway of ‘Nostra Aetate’ becomes the highway of the Church is of inestimable importance,” Rabbi Rosen said. Neocatechumenal Way Presents Holocaustian Symphony of Homage to Talmudic "Fathers in the Faith"
‘Traditional Catholics’ are wont to criticize the Neocatechumenal Way for its liturgical absurdities. Let us see what they have to say (nothing?) about this theologically and symbolically loaded symphony of race exultation in which Jesus’ mother is made to cry with ‘Jews’ of the Talmud (which teaches that her Son deserved to be executed) and “affirm” the “Shema Yisrael” which for centuries has connotated rejection of Christianity in general and specifically the Christian doctrines of the Trinity and Divinity of Christ. Dear traditionalist reader, what we have here, consistent with the modern Catholic mockery of Auschwitz replacing Calvary, is Mary crying with ‘The Jews’ at the foot of the ‘gas chambers’ instead of crying for Jesus at the foot of the cross. Are you in ‘full communion’ with this outrageous mockery? … The Neocatechumenal Way was founded in Spain, in large part, to further Catholic spiritual renewal and solidify the relationship with Jews. The group, now with more than 80 seminaries around the world and a major center in Israel’s Galilee, is presenting a free symphonic concert in Lincoln Center’s Avery Fisher Hall (May 8 at 8 p.m.), billed as a “musical gift to the Jewish people.” (Advance registration required, by calling  998-9469). The symphony, entitled “The Suffering of the Innocents,” is being presented as an homage and prayer to Holocaust victims in particular, viewed through a Catholic prism of Mary crying and united with Jewish mothers in the concentration camps, affirming “Shema Yisrael.” The elaborate piece — for 100 musicians and 80 choral singers — was composed by the movement’s founder, Kiko Arguello, a painter and theologian, who has stated that his symphony is being offered “as a bridge of love and reconciliation. [‘Holocaust’ Dispensationalist Theologian] Rabbi Irving “Yitz” Greenberg told The Jewish Week that The Neocatechumenal Way is “primarily a lay inspiration group that has done no missionary work and has no missionary interest. They speak about Israel like the Evangelicals do, that the Jews are ‘God’s people.’ And Israel is ‘God’s Promised Land.’ They specialize in a respectful attempt to help Catholics better appreciate the Jewish people and the Jewish religion, as well as raising an awareness of how much the Jews have suffered, including from Christians. Rabbi Greenberg added, “’The Suffering of the Innocents’ addresses the theological problem of suffering, often using Christian imagery, but also refers to the fact that the Jews are the classic example of innocent suffering. And just as God has a special love for the suffering innocent, so should Christians have a love for the Jewish people. You are currently browsing the archives for the Neocatechumenal Way category.